The sciatic nerve is the main conduit of life energy from the spine to the lower body. This nerve can become compressed by the piriformis muscle, creating a painful condition known as piriformis syndrome. This disorder is a type of pseudosciatica that can cause a variety of uncomfortable symptoms in the buttocks, legs and/or feet. All types of sciatica are typically treatment-resistant. However, this fact is not a reflection of the stubbornness of the pain in most patients, but instead is caused by misdiagnosis of the actual causative mechanism. Remember, if the true cause of pain is never identified, then it can not be treated. This is the primary reason why so many sciatica pain conditions persist despite active treatment, regardless of why they are said to exist. This essay explains the role of the sciatic nerve in piriformis syndrome. We will also discuss some general information about sciatica that is useful for any patient who suffers from lower body radiculopathy or pseudosciatica. The sciatic is the body’s largest nerve. There are bilateral branches that originate in the lower back and innervate virtually the entire lower body, including the legs and feet. The sciatic is composed of nerve roots from 5 spinal levels that all combine to form the structure. These roots include L4, L5, S1, S2 and S3. It should be noted that out of these, L4, L5 and S1 are the roots most often implicated in the majority of all back pain diagnoses. The sciatic forms after these nerve roots exit the spine and form together a short time afterwards. Once the fully formed sciatic nerve is created, it traverses a path from the side of the spine down each leg. Along this path, the sciatic encounters the piriformis muscle near the hip. It is in this location that the sciatic can become compressed if the muscle spasms and clamps down on the neurological tissue. You can learn all about the form and function of the sciatic nerve on Sciatica-Pain.Org, the leading online information resource detailing everything related to sciatica. The sciatic usually runs inferior to the piriformis muscle, which means that when viewed from the frontal perspective (the coronal plane), the nerve would be behind the muscle. This classification of objective normal is called a Type A piriformis/sciatic nerve relationship according to the work of Beaton and Anson. However, a substantial percentage of the population demonstrates abnormalities of the piriformis in relation to the sciatic nerve. These abnormalities are classified as Types B, C, D, E and F, with each describing a specific variety of anatomical irregularity in relative positioning. In some cases, the sciatic runs through the muscle, while in other cases the nerve can encircle the muscle or travel in front of it. We detail all of these anatomical irregularities in our dedicated essay covering the sciatic nerve through the piriformis muscle. Regardless of whether the nerve position is typical or atypical, the person might suffer compression of the sciatic due to piriformis spasms. However, the diagnostic rate for piriformis syndrome is higher in people who demonstrate Type D, B and E atypicalities. The sciatic is a major focus of diagnostic efforts in many chronic pain sufferers. It is known as the most problematic nerve in the human body, since pain here is typically severe, unrelenting, chronic and defiant to curative care. 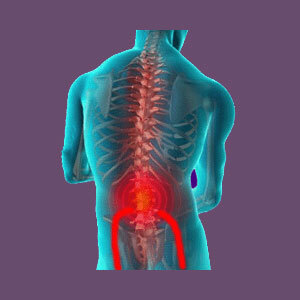 Many patients suffer from sciatica for the remainder of their adult lives. In the case of piriformis syndrome, the pain is not really true sciatica. Although the symptoms might be identical, the causation does not reside in the lumbar or sacral spinal regions and does not affect the nerve roots directly. Therefore, the symptoms are correctly known as pseudosciatica, which can come about from a multitude of possible origins besides the piriformis. This fact definitely hinders diagnostic efforts for many patients and often results in mistaken diagnostic theories that help to explain why treatments are known to be so ineffective. Patients should understand that piriformis syndrome is just one of many potential causes of sciatica and pseudosciatica. Therefore, they should always be cautious before accepting any diagnostic theory without definitive evidence of pathology. Since piriformis diagnosis is a highly subjective process, patients must take extreme care or possibly waste time and money, while suffering the entire time, pursuing treatment for a condition which may not be their true source of pain.